Turns out, wireless is the future of VR after all. If the HTC Vive has one flaw, it’s that tangle of cords that constantly threatens to trip you up. But thanks to a partnership with Intel, the promise of a wireless (yes, wireless!) HTC Vive is just over the horizon. You might have thought we knew everything there was to know about HTC’s VR headset: the hardware, its price, even a handful of cool launch titles. But HTC executives showed off some new additions to the Vive ecosystem at CES on Wednesday, including a new tracker and an improved audio accessory. They also announced a new partnership with Intel, and the launch of a wireless kit for the Vive developed by TPCast that will be available in the second quarter of 2017. HTC also plans to establish a monthly subscription service, a la Netflix, that will let users play a wide variety of VR games. HTC’s Vive, with the new Deluxe Audio Strap next to a vanilla Vive in the foreground. HTC was the first to make virtual reality “mobile”—not through a phone, but through the ability to move around a physical space and interact with virtual objects through a pair of controllers. For example, a Vive user can hold a controller in either hand, complete with a thumbstick and trigger, and simulate reaching for a backpack by putting their hand on their shoulder. The Vive Tracker adds another virtual object to the space. A little larger than a deck of playing cards, the Tracker serves as a placeholder of sorts for a third virtual object. 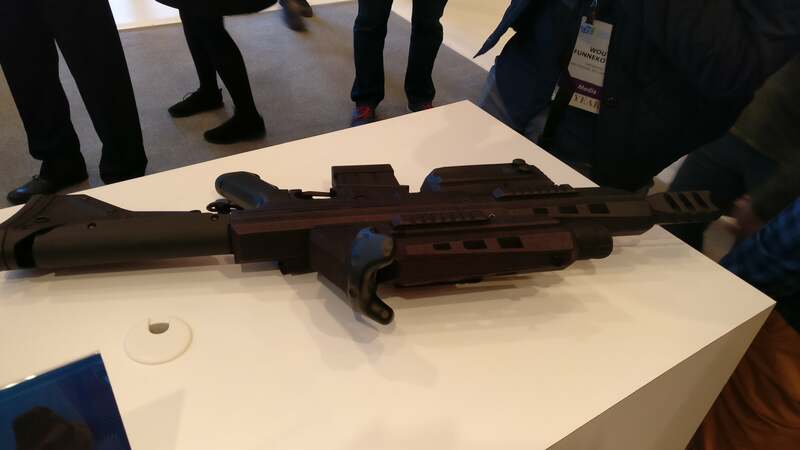 HTC executives showed off how it could be built into a replica of a rifle, to mimic how a user could hold a virtual blaster to ward off aliens. 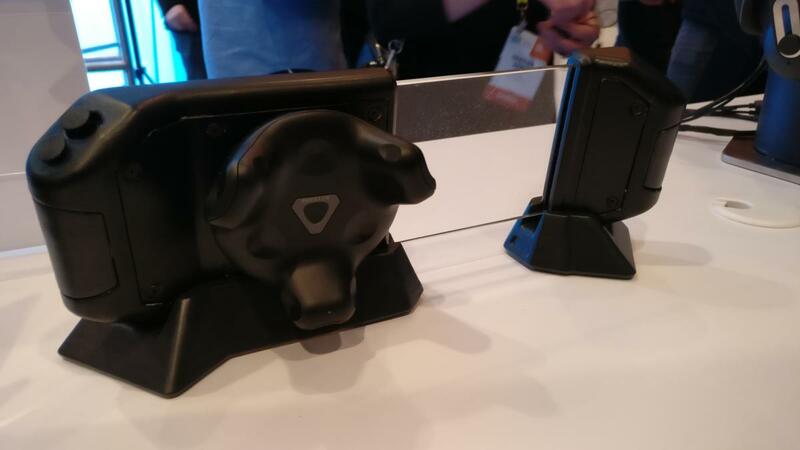 The Vive Tracker is 10cm long, a bit smaller than the current Vive controller. It will have about 6 hours of battery life, executives said. Dotdotdash, a developer and partner of HTC’s, showed off how it used the Tracker as a virtual “camera” that the player could physically hold and snap “photos” of in-game scenes, complete with zoom and other effects. HTC will give away 1,000 Trackers in 2017 to developers, in much the same way it seeded entire Vive systems to get the ball rolling on content. The Tracker can be used in a “gun” as well. HTC also promised an improved audio experience in the form of another accessory. 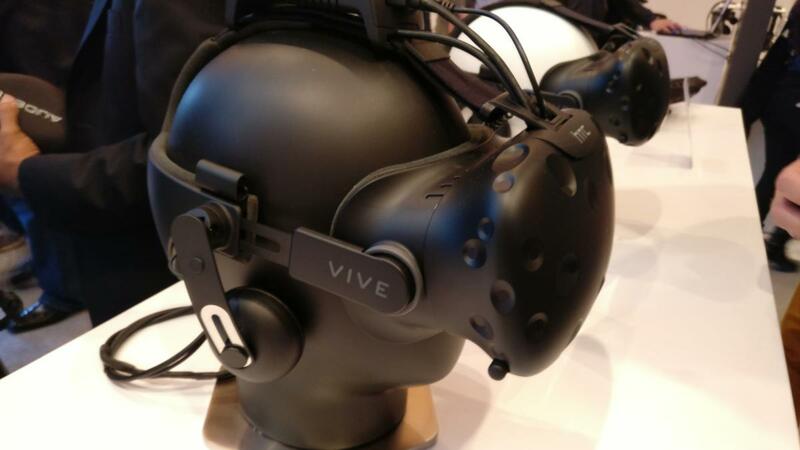 Dubbed the Vive Deluxe Audio Strap, the new experience is about “convenience and comfort,” O’Brien said. The headset, which will replace the current audio portion of the Vive, will have another advantage: It will route the current cables out of the side of the headset, rather than the rear, which will hopefully make it a bit more comfortable for users, according to O’Brien. Unfortunately, HTC disclosed neither the pricing nor the availability of either the Tracker or the Deluxe Audio Strap. Both will ship in the second quarter of 2017, and the company will release the price closer to launch. But cables are still cables, which is why HTC’s partnership with Intel to take the Vive wireless is intriguing. HTC didn’t say when the Vive would actually go wireless or what its price point will be, let alone what the performance would be like—it’s more of a prototype at this time. But the tether will actually be wireless, using a technology called WiGig. Intel has said previously that it sees tethered and untethered VR merging, and the high-speed WiGig connection makes that a reality. Previously, HTC partnered with wireless company TPCast, which announced that it would be providing a wireless upgrade module for existing Vive systems back in November 2016. That system will launch during the second quarter of 2017, executives said, for $299. The module will have a 6,000mA battery sufficient for 2 hours of use, according to HTC. Over the past year, HTC and its partners developed about 1,000 pieces of content, including games and other apps that can run on the Vive. But discovering them all can be difficult, especially with many of them requiring users to cough up a few bucks. Rikard Steiber, president of HTC’s VR app store Viveport, said that HTC will offer a monthly subscription for users to experience as much new content as they want. The price and launch date hasn’t been set. However, you can already play about 300 Vive games across a series of arcades in China. HTC’s goal is to expand that video arcade experience to about 5,000 different arcades worldwide by the end of the year.